On arrival at Harwich, the slowly retreating night revealed a very cold, damp and misty morning. The roads contained far heavier traffic than we’d seen for ages, and everybody seemed to be in a hurry. We had a plan and an appointment, the outcome of which would dictate our next few days at the very least. One question we’ve been asked several times is what we’ve done about the van’s MOT. The answer’s simple. Nothing. We got the van tested just before we left, in May 2011. So, of course, it expired in May 2012, whilst we were in Montenegro. There’s not many garages issuing UK MOTs there. 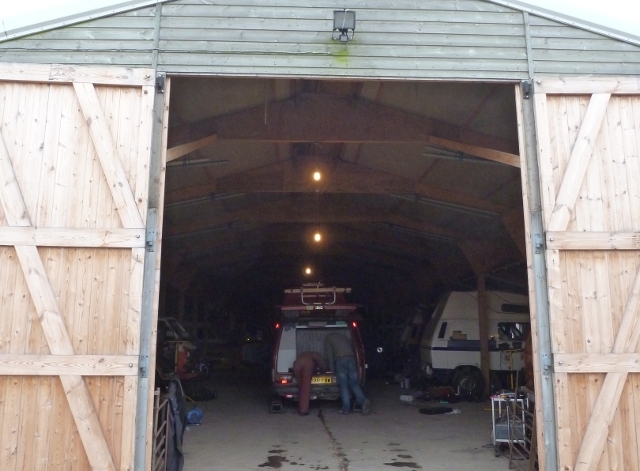 So our first stop was near Grantham, to see Andy Simmons of Campershack. Once we’d found his workshop in a farm unit, been handed a steaming mug of tea, and had a good natter about travelling round Eastern Europe (Andy used to drive coaches to Hungary, Czech, Poland and other places almost as soon as the Iron Curtain fell), he started to have a good check over. Our breath was firmly held. Before long, a verdict was pronounced – “Looks good to me”. An exhalation of breath didn’t last long – the upper ball joint on both sides needed the rubber dust cover replacing. The first side went well, with the actual joint in good condition, but a shortage of time meant we had to leave the other untouched in time to go for the test itself. After a short walk around Grantham town centre, we returned to the garage to get the news – PASS! However, we would need to replace that second ball joint. Back at Andy’s, a good used joint was liberated from a scrap van. Eventually, a somewhat swamped courier arrived with the new tyres we’d also ordered, since we’d worn out the ones fitted in Sarran last summer – but there wasn’t enough time to do anything with them. Into the back they went, to be fitted elsewhere, elsewhen. We were free to head back to Chorleywood, to see our lodgers and friends, Matt and Beri, and to figure out what to do next. The trip might be over, for the moment, but we’ll continue to blog. Posts might not be quite so frequent, reflecting on our travels and our next steps – and viewing the UK through refreshed eyes. Please continue to read – if you’re not already subscribed to receive new posts by email or RSS reader, now’s probably a good time to do that. We don’t know what or where we’ll be, but whether we settle down again or turn around and head straight back off to somewhere warmer, we’d love you to stay in the van with us. This entry was posted in By Country - UK, Personal stuff, Site stuff, Van stuff. Bookmark the permalink. I stumbled across your blog via the club 80-90 forum and have just spent the last three weeks of spare time at work reading it. We have also done a bit of travelling, with and without campervans (Backpacking without) and I remember exactly how difficult it was to come home and knuckle down to reality. The most frequent comment we have experienced on arriving home is, “you are very brave doing a trip like that”. My answer is always, “no, coming home was the brave part”. If we had the finances and domestic circumstances to do it again, we would be off tomorrow. Thanks for a very well written and entertaining blog. From another Adrian C.
Welcome ‘home’ though perhaps ‘home’ feels more like your trusty van now. Look forward to the next adventure and what a journey so far. Son has just headed to Oz for two years of work and travel so I am tagging along there at the moment ..from my armchair of course! Thanks, Lynne. Yes the van is our home for now, although mostly enjoying indoor hospitality on these cold evenings!